Opening view, 5pm Thursday 24th October 2013. NCAD Gallery install photograph of the exhibtion, Learning from Peter Rice: Under the Skin. 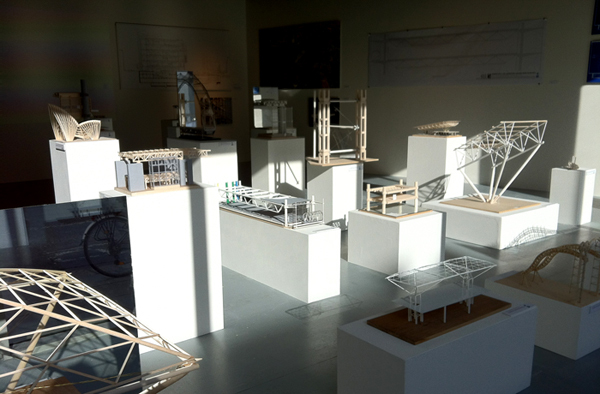 The National College of Art and Design Gallery welcome an exhibition that includs the work of Dublin Institute of Technology (DIT) 3rd and 4th year students of Architectural Technology, who undertook a systematic analysis of 11 of Peter Rice’s best-known projects. Peter Rice (1935–92), a maker of ingenious things, is widely regarded as the most distinguished structural engineer of the late twentieth century. He combined contemporary tools of computer-analysis and mathematics with a sensibility for materials, natural light, and structure. His impact on the built expression of France can be recognized in the Centre Pompidou, La Villette, the inverted pyramid of the Louvre, le nuage at La Défense, the TGV station at Roissy–Charles de Gaulle, and the Full-Moon Theatre at Gourgoubès on the edge of the Cévennes. A native of Dundalk, Ireland, he joined the London office of Ove Arup & Partners in 1956, becoming a director in 1977. A universal man of such achievements as the Sydney Opera House, the Menil Collection at Houston, and Kansai Airport near Osaka, Rice scouted the horizons. In 1982 he formed the Paris-based design workshop RFR – a locus for experimental and innovative projects, including his work with the artist Frank Stella. The influence of Peter Rice is strongly felt worldwide in contemporary architecture and engineering. Although he never built in Ireland, his cultural traditions are discovered there in the design of Fingal County Hall and in the work of the Irish artist Vivienne Roche. 5pm- 8pm, Thursday 24th of October 2013. NCAD Gallery & Harry Clarke House Lecture Theatre, NCAD. Ceremonial opening of ‘Learning from Peter Rice: Under the Skin’ exhibition will take place in NCAD gallery at 5pm followed by a viewing of a film on Peter Rice commissioned by Arup (Irl) will take place at 6pm in The Harry Clarke House Lecture Theatre, in NCAD. 6:30pm- 8pm, Thursday 24th of October 2013. The Harry Clarke House Lecture Theatre, NCAD, 100 Thomas St, Dublin 8. Peter Ronan Rice was born on the 16th of June 1935 at 26 Upper Pembroke Street, Dublin, the eldest child of University-educated parents, who lived at 52 Castle Road, Dundalk. His father, James Rice, attended the London School of Economics for two years (1918-1920? ), and was the Chief Education Officer of the Co. Louth Vocational Education Committee. Peter's mother, Maureen Rice (née Quinn), an outstanding student, graduated in Commerce from University College Dublin. Her father, 'Dada' Quinn, was the headmaster of the Primary School in Inniskeen, 16km west of Dundalk. He took a keen interest in the mathematical education of his grandchildren. During Peter's youth most young Irishmen and women emigrated, leaving school at age 12 with a Primary Certificate of Education. Dundalk, an industrial town and port, home to the engineering workshops of the Great Northern Railway, and factories for brewing and cigarette making, was blessed with several schools at second level. Peter first attended the Marist Brothers School, Dundalk, but his mother moved him to the more demanding Christian Brothers School, CBS - Coláiste Rís (1869), an all-boys school, where he received an Irish Catholic education (1948-1950) preparing him for the Intermediate State Examination in mathematics, languages and the sciences. Peter was in the A stream, where Irish was the language of instruction. He left in June 1950 with the judgement, an sháisúil, very satisfactory. The Irish Christian Brothers identified the brightest among their students and drove them hard to succeed, in County Council, State and University scholarship examinations, using the Brothers' eponymous textbooks, outstanding science laboratories and technical workshops. The inventor of the modern submarine (UK, US & Japanese Navies) Br. John Philip Holland (1840-1914) was the first teacher of mathematics at Coláiste Rís, Dundalk. With the energy of an emancipated church (1829) and country (1922) the CBS educational model of Bd. Ignatius Rice (1762 - 1844) spread around the world, but not without controversy in more recent times. The Dominican religious Order of Preachers, OP (1214), has had a Priory in Dundalk since 1777. Peter transferred to its all-boys boarding school on the Liffey, Newbridge College OP (1852) for the final two years of his secondary education (1950-1952) and Leaving Certificate Examination. The Catholic ethos of the school was in the Dominican tradition of individual development and tolerance. The walls of the science laboratory were graced with pictures of the great Dominican theologians, Thomas Aquinas, Doctor of the Church, and Albertus Magnus, asserting that natural philosophy, i.e. science, was the handmaid of theology. The plastic and performing Arts were the concern of the formidable Henry Flanagan OP (1918-1992), son of a Dublin carpenter, Dominican priest, organist, choirmaster, producer of Gilbert & Sullivan operas, set designer, painter, ceramicist, founder, sculptor in wood, clay and stone, teacher of history, literature, music and art, and remembered by those Irish artists whom he influenced as "the preacher in stone". He sculpted in the public area of the school so that he might engage inquisitive boys in conversation on the sculpture of the Rinascimento, on il disegno - sculpture mimics divine creation, and on Gothic architecture. The piece "Head of a boy" dates from the years when Peter was in attendance. The schools of Peter's teenage years are now very different educational institutions. Peter matriculated in Queen’s University Belfast in September 1952 to read aeronautical engineering; but he changed direction, graduating with a degree in civil engineering in 1955. He moved to London and enrolled in the Imperial College of Science, Technology and Medicine, taking the taught-masters programme in the theory and construction of shell structures, graduating in 1956. He joined the Anglo Danish consulting engineering practice of Ove Arup (1895-1988) & Partners (1946), who had worked with the Dublin architect Michael Scott (1905-1989) on the design of the shell roofs of An Busáras (1945-1953) and the CIE Bus depot at Donnybrook (1952). Peter reported to Ronald Jenkins (1907-1975), senior partner at Arup, who initially led the Arup contribution to the design of the Sydney Opera House won by the Danish architect Jørn Utzen (1918-2008) in January 1957. Peter stayed with Arup all his working life contributing to its international reputation. At twenty-two years of age, living and working in London, Peter Rice (1935-1992) may be said to have completed his Irish education. The National College of Art and Design Gallery (NCAD Gallery), 100 Thomas St, Dublin 8. Opening hours, 1pm - 5pm, Monday – Friday.